USA Renovations has provided Stained Concrete services not only in the DFW metroplex but also the 48 states. With integrity + results being the focus of the service we provide, we won’t settle for quality other than the best. We manage several crews which allow us to fit your needs, your schedule and your demand. Whether you are a general contractor or direct buyer, we want to work with you and provide the best Stained Concrete service possible. If you are seeking an elegant surface which is beautiful, welcoming, and very economic, stained concrete is your solution. Stained Concrete is not a topical coating or a paint, rather a penetrating mixture of stain concentrate, water, forms of acidic liquids, and inorganic salts that when applied to a cementitious surface chemically reacts with the calcium hydroxide within the concrete surface. This chemical reaction allows for a permanent bond to the hydrated lime which allows for a long and economic life cycle. Sustainable – Staining a concrete surface will reduce the maintenance over the surfaces life cycle. As an exposed concrete surface is much more durable with the stain chemically reacting with that surface, this application allows stained concrete to remain as a proven sustainable surface. Unsurpassed Water Resistance – Being that water is the earth’s most corrosive resource, stained concrete is “for the most part” completely unaffected by the remnants of water. With the slab being exposed moisture will still pass through the concrete but will once dry will not leave a lingering effect. Energy Savings – Thermal Mass is a basic property of concrete and with an exposed concrete surface the slab is able to slowly absorb and release hot and cold climate. With no carpet or wood to dissipate the surrounding heat/cold, the slab uses its thermal mass to its maximum potential. This in turn slightly makes your climate control more efficient. Less Maintenance – With an exposed stained concrete surface maintenance is much less than that of a tile, wood, carpet, or laminate. Better suited for large areas stained concrete will reduce the cleaning efforts with only requiring auto scrubbing or light mopping. Inexpensive – Don’t be fooled by the price, stained concrete can be achieved for much less than you think. Using your existing concrete slab our process of staining is quick and effective making this a budget friendly choose. Slip Resistant – Stained concrete will not change the slip coefficient, however, your already existing slab has a high slip coefficient of friction already built it. Keeping your surface exposed and enhancing the image with a stain will keep slips to a minimum while keeping the surface looking beautiful. 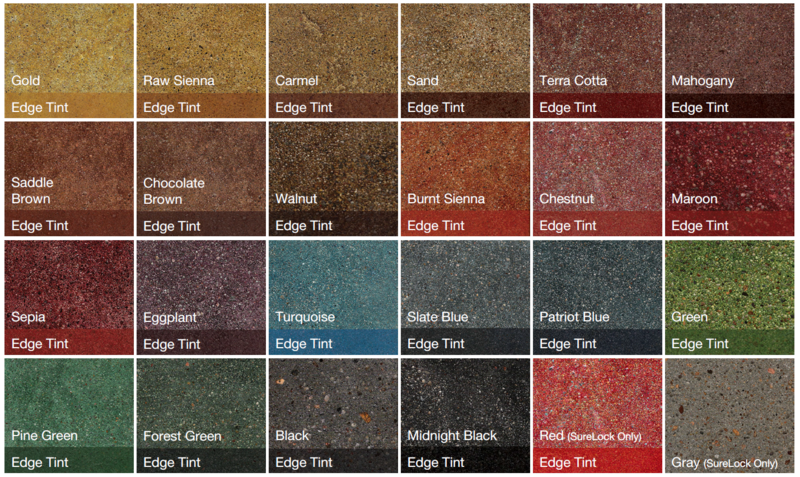 Stained concrete is a chemical concentrate that is available in powders or liquids. Both are mixed with chemical reaching with the slab that is achieved in simple terms, there are two parts that make up epoxy. They consist of 1) an epoxy resin which is cross-linked with 2) a co-reactant or hardener. Epoxy coatings are formulated based upon the performance requirements for the end product. When properly catalyzed and applied, epoxies produce a hard, chemical and solvent resistant finish. WHAT IS COEFFICIENT OF FRICTION AND WHY DOES IT MATTER? HOW IS STAINED CONCRETE INSTALLED? 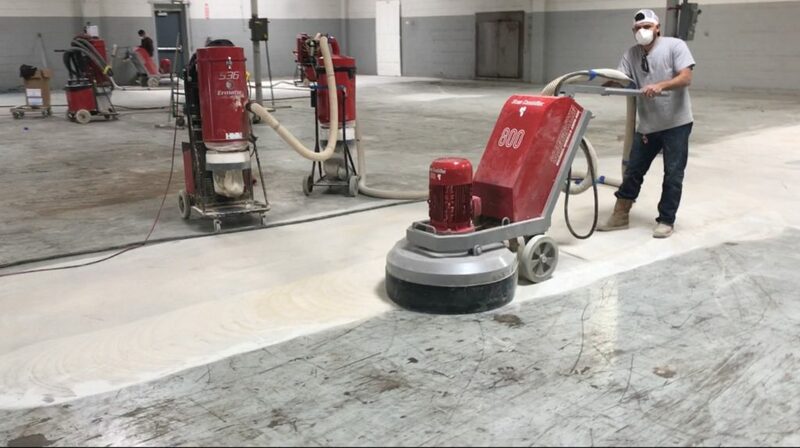 We recommend the use of concrete grinders which use coarse diamond segments to refine the surface of minor pits, blemishes, light coatings or prior stains from the floor. This eliminates the majority of imperfections that stain’s translucent finish may show when not prepped professionally. After preparation of the surface has been performed it is time for the mixture of stain to be installed. Using a special pump sprayer, we evenly apply the stain to the surface throughout the job until full coverage is met. The stain becomes dry to the touch in 15 – 20 minutes with full cure taking place within 24 hours. Once the stain is fully cured the surface residue is removed. If the stain is an acid-base it requires neutralization using baking soda or ammonia. If the stain is water-based it does not require neutralization and can simply be cleaned with the use of an auto scrubber. After this cleaning is completed an optional clear coating sealer is used to protect the stain. GET YOUR CONCRETE STAINED TODAY! What are you waiting for? Now that you understand our process a little better and the benefits have been outlined, let’s talk about your space! 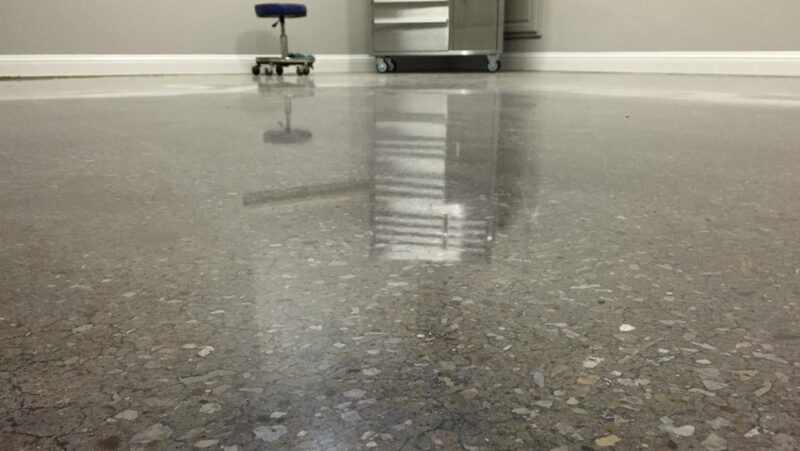 If you have any additional questions about the Stained Concrete process itself or would like a FREE quote on your floors, contact us today by calling 972-984-4673 or email us at john.clark@usarenovations.com.